Normally, when a company is desperately trying to reinvent itself with a new 'with-the-times' image, it'll avoid the things that saw it fall so far behind. BlackBerry, it seems, has a different idea. Today it launched the new BlackBerry 9720 smartphone, not running the BlackBerry 10 operating system it is desperately trying to establish, but the BB7 OS that stood guard during the company's fall from grace. The device, which harkens back to the Curve handsets of previous years, brings the traditional QWERTY keyboard, a 2.8-inch touchscreen, a video-capable 5-megapixel camera, Wi-Fi and an FM radio. The new 9720 also arrives with BBM and the Multicast tool, enabling users to post statuses to multiple social platforms at once. The company is planning to launch the BB7-running handset in selected markets in Europe, Asia, Africa and Latin America, but there are no specific country-by-country details as of yet. BlackBerry may be of the opinion it can still bring in some much-needed revenue in emerging areas, in much the same way Nokia was able to with its Symbian OS, long after deciding the software was passé. However, with BlackBerry desperately attempting to shift the spectre of the last few years, the decision to continue with the dying platform will certainly be questioned in some quarters. BlackBerry for sale? 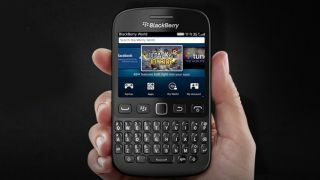 The smartphone-maker formerly known as RIM officially confirmed it is actively exploring an exit strategy.